It is no surprise that computers have been able to beat humans at common games we play. IBM Watson made its mark by beating winners of the widely acclaimed game Jeopardy and the Deep Blue Supercomputer challenged and beat Garry Kasparov at chess almost 20 years ago. Computer software has been evolving since then and Artificial Intelligence (AI) is now targeting more human functions than ever before. One such effort is led by OpenAI, a non-profit artificial intelligence research company whose mission is to build safe AI and ensure AI’s benefits are as widely and evenly distributed as possible. OpenAI just announced the release of Universe, an open source software platform for measuring and training an AI’s general intelligence across the world’s supply of games, websites and other applications. As per the official OpenAI blog, Universe allows an AI agent to use a computer like a human does: by looking at screen pixels and operating a virtual keyboard and mouse. OpenAI is backed by Elon Musk, Sam Altman, Reid Hoffman and other individuals but also companies such as Microsoft, Amazon, Infosys etc. Microsoft is generally making a push for Artificial Intelligence and has been experimenting with Cortana AI and Internet of Things (IoT). Universe makes it possible for any existing program to become an OpenAI Gym environment, without needing special access to the program’s internals, source code, or APIs. It does this by packaging the program into a Docker container, and presenting the AI with the same interface a human uses: sending keyboard and mouse events, and receiving screen pixels. 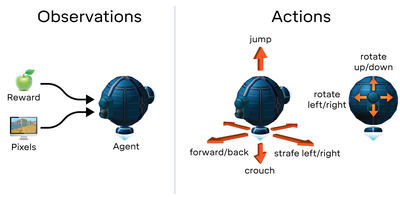 Our initial release contains over 1,000 environments in which an AI agent can take actions and gather observations. The architecture is built to attract a community of developers, gamers and users. Universe exposes a wide range of environments through a common interface: the agent operates a remote desktop by observing pixels of a screen and producing keyboard and mouse commands. If you want to help or participate in the AI movement, you can give OpenAI permission on your games, training agents across Universe tasks, integrating new games, or playing the games. Google’s DeepMind which has been developing and using AI in healthcare and data centers also open sourced DeepMind Lab which is a fully 3D game-like platform tailored for agent-based AI research. By open sourcing DeepMind Lab, developers get a highly customizable and extendable platform. As per DeepMind, new levels can be authored with off-the-shelf editor tools. Using an open interface for programmatic level-creation, developers can customize how AI can be applied to gameplay logic, item pickups, custom observations, level restarts, reward schemes, in-game messages and more. DeepMind is also making the software available on GitHub alongside all the code, maps and level scripts.